Here's the info on our speaker next Tuesday. If you can think of anyone or group that may be interested please send this notice to them. We are having Dr Carrie Tiepel speak on the Patient Protection and Affordable Care Act (PPACA), aka Obmama Care, at our Republican Party of Poquoson City Committee meeting on 4 September at 7:00 PM at the Poquoson Community Center, 49 Odd Rd, Poquoson, VA (towards the front of the High School entrance). 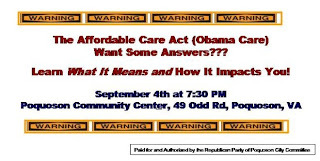 Dr Triepel has become a popular, passionate, and captivating speaker and opponent of the PPACA. Her recent appearances have included the Hampton Tea Party, VA Beach Republican Club breakfast, Williamsburg Tea Party, with other engagements scheduled. She's an orthopedic surgeon with over 13 year of medical experience and practices in Orthopaedic Surgery and Orthopaedic Surgery of the Hand. She is also a mother of four kids all under the age of 10, so we really appreciate her taking time out her busy schedule to speak to us. We are also opening the meeting up to the general public so we are hoping to be able to greet her with a crowd worthy of her time. An RSVP is not being required but we would appreciate an approximate houd count estimate a three days before the meeting if you can. 7:00 PM-7:15 PM, probably shorter - An abbreviated Republican Party of Poquoson City Committee (RPPCC) Meeting. Will discuss & solicit RPPCC members and general audience for volunteers at the Seafood Festival Republican Booth; will ask for volunteers at our three Republican precincts booths on election day; will discuss poll watchers program (briefly) and see if there is any interest among meeting audience; will notify members and audience of October's meeting date , location, and topic; and will ask for a motion to adjourn meeting to October, adjourn meeting for speakers.